We are back! It was a fun little trip. 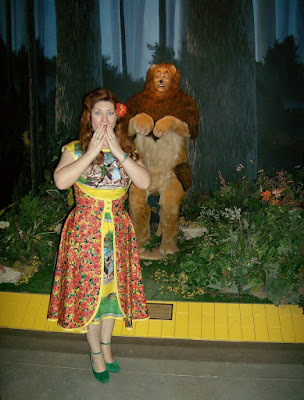 I'll start with the Wizard of Oz museum in Wamego, KS. I *thought* that it was a little farm house built out in the middle of no where like the film. But when we got into town, it was inside an old store-front building. This was their window display, very clever with the black and white look! Once inside, I saw that they had built a little farm house for the exhibit. You pay at the window, then walk through the door to "OZ". Here's the other side of the house, after falling from the sky! The tin ceilings were awesome. Who killed my sister? Who killed the wicked witch of the East? Was it YOU?? I do-I do-I do-I do-I DO believe in spooks! That's it for today, I took over 400 pictures, EEK! Today is my birthday and I'm just putzin' around the house. Thank you for your warm comments on my first sewing project, this Butterick 4790 dress! Unfortunately, we were the only ones in the museum at this time, (it was near closing time). How cool is this! And you looked so pretty!!!!! You look beautiful in your dress and it is just perfect! I would love to go there! My sister,daughter,and I have collected Wizard of Oz things for years! That is one of my favorite movies! That and 'Gone With the Wind'. Looks like y'all had a really fun time! How fun! You are a wiz with that sewing machine! Wish you were in my family and could help make me some costumes! I adored your Titanic and Gone With the Wind Dresses also. So pretty! I love anything to do with the Titanic too. In fact, on the cruise I'm going on in Aug we go to Canada and they have a big Titanic thing and you go to the graveyard where over 200 of the actual passengers are buried. I can't wait to go. Love your blog. It's always fun to come read all the fun things you do. That looks like a place I would LOVE to go. Wow! Looks like it was a fun trip. Can't wait to see the rest of the pictures. Happy birthday!! You looked absolutely wonderful in your dress! It was such a wonderful take on the movie. And you're Emerald City-green shoes are lovely! What a fun place to visit. Happy Birthday! Enjoy your special day! We all should hope to be as pretty as you. You did a very nice job. Happy Birthday to you Dear Nikki! You are adorable in that dress. Can't believe you MADE that! WOW!!! Looks like you really enjoyed your trip. Damn, why did you go near closing time? That dress needed to be SEEN!!!!!! I hope you at least wore it out to dinner or something! What a great birthday trip!! Looks like a fun place, perfect for you! The dress is darling, you look adorable in it! Thanks for sharing the pictures with us! Oh Nikki! You are just too cute in those pictures. They should hire you for their set. I want to rent the movie now. It's been quite a while since I have watched Oz. Followed you over to your blog from the Fedora Lounge. LOVE the dress! Happy Birthday! Best for going to the museum," The Wizard of Oz " is one of my favorite films. Happy birthday to you! Blessings. My birthday was 2/5. Your blog is adorable. Good week. c) OMG!!! I didn't know there was an OZ museum~ those pictures are fantastic!! Your dress is smashing! The museum looks super cool! You are just THE cutest darn thing!!!! THIS was your FIRST sewing project!?!?! IMPRESSIVE!!!!!! It looks fntastic and you look a-ma-zing in it. What a fun trip! I want to go see the Wizard!! HAPPY BELATED BIRTHDAY!!!! I have certainly missed you. House flip is done and I am back!! Woohoo!! Oh! And I posted before and after pics of the house. Come see me when ya get a minute! I missed your freakin' Birthday?! Just shoot me, seriously! I didn't even know you were back because I'm like 300 posts behind... ugh. Happy Birthday sweet friend! I hope you forgive me. Oops! See... I'm such a mess I forgot to tell you what a cute post this was and you looked darling!! You look so cute in your Wizard of Oz dress - Dorothy would have loved it! You are one fun gal!